Worldwide Free Comic Book Day Comes to Garland with Comics for All Ages! 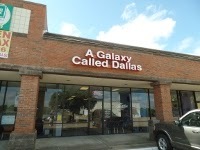 A Galaxy Called Dallas in Garland is one of thousands of comic book shops around the world celebrating the biggest day in the comic book industry and comic art form, Saturday, May 2nd. On Free Comic Book Day, over 5.6 million comic books will be given away by participating stores, introducing as many people as possible to the wonders of comic books! “A person of any age can find something to ignite that love of reading that will last a lifetime,” said James Pickering, owner of A Galaxy Called Dallas. Free Comic Book Day kicks off at 11 am and runs until 10 pm at A Galaxy Called Dallas 1238 Belt Line Rd. #365, Garland, Tx 75040. Call 972-530-2600 for more information.